Big name guitars are expensive. Many would say the price doesn't reflect the actiual instrument and you end up paying for the name badge on he headstock and not much else. Well my friends I have three suggestions for people who want their own frankenstein or wolfgang on a budget. 1. Peavey Actually make a wolfgang - Yes it's true, you can buy a peavey version of the Wolfgang that's less expensive, but that comes with it's own issues. The guitar would be worth more without the Peavey sticker on the headstock - Anyone familiar with the 'Undercover Boss' disaster knows just how badly Peavey treats its emplyees - but if you have no morals then be my guest. 2. Buy an Aliexpress knock off. Sure many of those are great guitars but beware. I learned long ago that while the basic instrument is often fantastic, the hardware installed is usually questionable and many times installed by blind monkeys (if some of my past purchases are any indication) Start learning how to install your own electronics and hardware if you want to turn one of these knock-offs into a fantastic instrument - 30% are fantastic out of the box. Most of them will be unplayable out of the box. 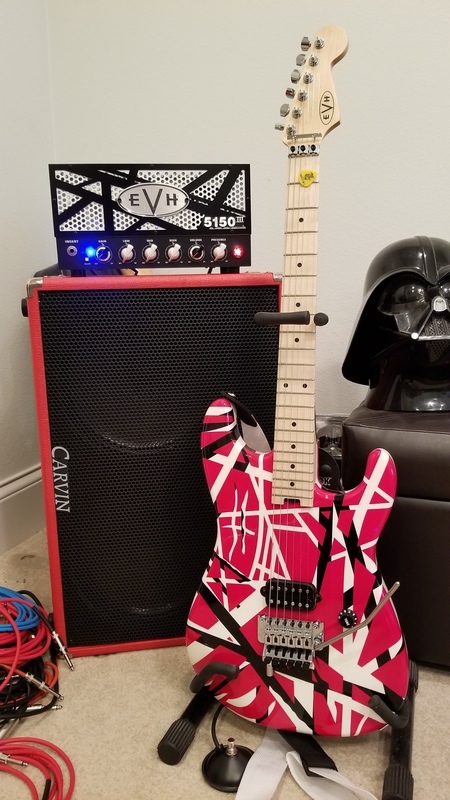 Your post seems quite random choosing an EVH brand. But OK, I have all three types and can comment..
Actually I think I'll refrain other than to say the USA version as you imply, is just a "name", is not. It's just like any other high quality US made guitar. It has all the elements ..that's it. Yes correct. It was a very random post that wasn't all that serious. But you raise an interesting point as far as country of manufacture. Being serious for just a moment - No I didnt refer to USA made guitars - but yes its true, consumers are asked to pay a huge premium for brands like Gibson for example just because it's made in the USA. Ive never understood this - There are amazing craftsmen in many countries. I own way too many guitars - some are MIA and they are good instruments (slightly better than the MIM ones) but the MIJ guitars seem to be consistently the best. However, that being said, I fully believe that American made PRS guitars are in a different league - my god they are spectacular. You can take a cheap guitar and put Clapton, Beck, Page or the likes on it and they'll make it sound great because tone friend is in the fingers. Not necessarily thru any amp with any guitar. You either know how or you don't. You give me any of EVH's personal guitars and I'll have him yelling "Tone it down! Tone it down!" Buying an EVH guitar, or any signature guitar is a lesson in "it ain't the guitar, it's the player." An amazing player using a $100 guitar will destroy an average one with a $3,000 dollar one. There is something to be said for a well made instrument though. It makes the whole experience just that much better - Does it really matter how much you paid or who's badge is on the headstock (In my opinion.....not one bit) - This jokey thread is actually kind of interesting now. I do like the EVH Wolfgang Special that's MIM. I like all the features it has and I will own one soon enough. I would like the ebony fretboard, but choosing between Antique Ivory or Candy Apple Red is tough. Huge premium? You can buy a low end MADE IN ‘MURICA SG for the price of a MEXICAN Fender, or Korean Gretch, or some SE PRSes. Show me any MIA guitars that come close to entry level Gibsons- in price. If that's true where-ever your from then great! Here's the one I own, I sometimes have the guard on and sometimes not. It goes on easily and quickly with just tightening the vol. pot nut. I had purchased a separet pick guard and cut just the portion for the vol. knob which in this case says "Tone" on it like his. If you're especially ambitious this is the guitar that became the red, white and black. have a try at it! MIM at the Fender Mexico plant. I love mine, great guitars!! Every EVH guitar I've ever owned (3 of them) or played has been a top quality guitar with it's own feel. Certainly not just another Strat or LP feeling/sounding guitar. So they wouldn't be everyone's cup of tea. In fact many don't like the compact feel of the EBMM/Wolfgang guitars. - Fair enough. Yet I find the necks to be absolutely fantastic. And the EBMM pickups - still available on the Axis - are about the best stock pickups I've ever played. The Fender Wolfgang pickups aren't far behind the EBMM's. Just a little brighter and not as warm. As for signature guitars being some form of substandard... Some of these are just a version of the stock guitar with an artist's name on the headstock. This is simply not the case with EVH guitars. Judge by the product, not the signature. The Wolfgang pickups are amazingly good, excellent clarity and definition. Buying an EVH guitar is a lesson in buying a guitar ...that is ...an EVH guitar. As is buying a loaf of bread is a lesson in buying ..a loaf of bread ...because you were hungry. Well ..pic time. What could possibly be more entertaining?? My college cover band (mid 1980's) covered a lot of Van Halen songs. I understand that some people like the newer knock-offs and other people think they're silly.